After all the excess of the holidays, nothing appeals to me more than a simple soup to warm the body and soothe the soul. I crave comforting texture, wholesome ingredients, and straightforward flavors. This white bean and kale soup has it all. 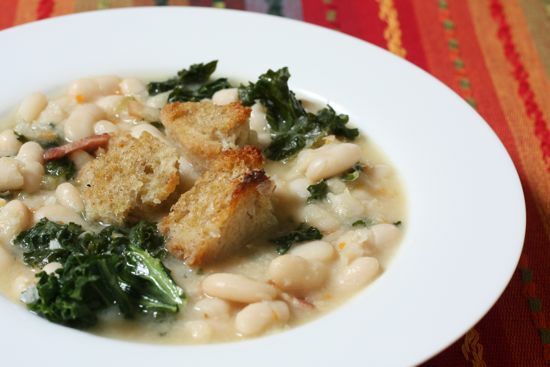 The recipe is based on all my favorite elements of rustic Italian soups, beginning with fat white cannelini beans for their mild taste and creamy texture. Navy or Great Northern beans will work, too, but I’m especially fond of cannelini, which are easy to find now at many supermarkets. They cook up beautifully, hold their shape and serve as a satisfying backdrop for the assertive kale. Don’t be tempted to substitute canned beans here. The dried beans create the creamy broth as they cook with a flavor base of aromatic vegetables, rosemary. I also throw in a chunk of Parmesan rind from the supply I save in the freezer for just this purpose, but it’s not essential. Cooking the beans from scratch isn’t difficult. It just takes a little more planning and time. This is slow food suited to a cozy winter weekend. It’s the perfect antidote to the hectic holiday season. Rinse and pick over beans. Place in a large, heavy bottomed soup pot, cover with water and let them soak overnight. The next day, mince the garlic, onions, celery, and carrot. Warm 2 tablespoons olive oil in a medium skillet and saute the minced vegetables over medium heat until they begin to soften but have not browned. Add the vegetable mixture, rosemary and Parmesan rind to the soaked beans, increasing water to cover beans by about an inch. Bring to a boil for 5 minutes, reduce heat and simmer, covered for 1 to 1½ hours, until beans are tender. Add more water during the course of cooking, if necessary, to keep the beans submerged. While beans are cooking, preheat oven to 350 degrees. Remove crusts from bread and tear it roughly into small chunks for croutons. Toss in a medium bowl while drizzling with with 2 tablespoons olive oil to distribute oil evenly. Spread out on baking sheet in a single layer, season with salt and pepper to taste, and toast until golden brown, about 20 to 25 minutes. Set aside and let cool. Wash kale in cool water, drain, and dry on a clean kitchen towel or in a spin dryer. Strip leaves from stems and cut crosswise into 1-inch ribbons. Heat 1 tablespoon olive oil in a large skillet or wok over medium heat and fry bacon until it begins to brown and crisp. Add kale and toss. Cover and cook, stirring occasionally until the greens begin to wilt. When beans are tender, remove the cheese rind. Scoop out about 3 cups of the beans and their liquid and puree in a blender or food processor. Return pureed beans to pot. Add kale and bacon mixture, and red pepper flakes. Season with salt and pepper and cook over low heat for 15-20 minutes. Add more water, if necessary, to achieve the consistency you prefer. Ladle soup into bowls, top with toasted croutons and drizzle with olive oil. Pass grated Parmesan for diners to sprinkle over the soup as desired. Oh I love soups like this! I’ve been in the same mode/mood since Christmas. Yummy! Aleta I was just thinking about Kale (a super food). Amanda buys a wonderful Kale salad in Westwood. This will hit the spot! I have one question. Would I ruin the flavor, if I left out the bacon? Linda, I’m glad this appeals to you. Of course you can leave out the bacon. I like it for the flavor and texture but it’s not the lynchpin of the soup. Just substitute a little more olive oil when you saute the kale. the White Bean and Kale soup. I’m glad you like it. The credit for all the technical aspects of the site goes to my webmaster and son, Gabriel. One question about the white bean and kale soup: Once the beans are soaked overnight, do you drain them and cook in fresh water — or do you cook the beans & rest of the ingredients in the soaking liquid? Looking forward to preparing this one…. Joan, I don’t drain the beans unless I want to cook them in broth. The idea that changing the water reduces the compounds that cause flatulence is not universally accepted and i haven’t noticed a difference whether I drain or not. On the other hand, if draining works better for you, there’s no reason you shouldn’t. Draining just seems like a waste of water to me. I hope you like it.